Mizzou Baseball will play SEC East Division rival Georgia in the first ever college game at Suntrust Park, the brand new home of the Atlanta Braves. The game is scheduled for a 12:30 p.m. (CT) first pitch on Saturday, April 8. 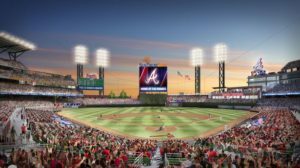 Suntrust Park is the new $622 million stadium for the Braves. The first game will be March 31 as the Braves play the New York Yankees in a preseason game. Mizzou and Georgia will play the first college game a week later. Mizzou has played at Kauffman and Busch Stadiums as well as the Metrodome, the former home of the Minnesota Twins, and Minute Made Park, the home of the Houston Astros.